In 2011, Robert Belenky set out on a trip for the Ukraine with a mission: to record the memories of Jews who lived through one of the most tumultuous times in all history, the era spanning the post-revolutionary Russia, the Holocaust, and World War II. His interest in this area and this subject is lifelong, an unintentional gift from his father. Max Belenky wanted to be a farmer, and before the war, he was instrumental in bringing tractors to Jewish collective farms and, as head of a tractor team, taught people how to use them. Now his son, Robert, wants to know more about his father's birthplace, and what happened to the people there. 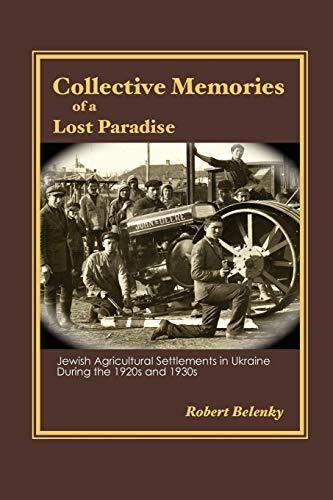 "Recently, I learned that the settlers were for the most part not Zionists but rather non-ideologically committed poor people seeking a better life, or socialists of one sort or another," Belenky writes in this poignant book, part memoir, part Jewish history. "These were Russians who were also Jews, people who wanted most of all to be contributing members of the new Soviet society. Jewish identity at the time had less to do with Zionism than concern with the building of socialism, with having a better life and making the world a better place." Belenky's book describes a personal and poignant journey and he records stories told by people whom time and history would have forgotten if it were not for him.